No often do we get to see a game this great, as I always lived by the adage of "90% of everything is crap. ", it only makes the good 10% that much better. Let's get started, shall we? 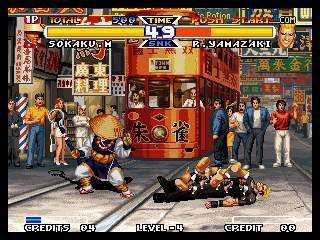 RBS is the 6th installment of the Fatal Fury series and the second of the Real Bouts. A total of 19 fighters and 5 hidden/alternates make their way into this game. With that said, it's time to break it all down. Stunning! The Backgrounds are very crisp and are truly a sight to behold. Billy's Stage (my personal favorite), with the breakable monitors in the corners, start to go on the fritz as you knock your sorry opponent into them, then shock them when they give. God, It's a thing of beauty. Other great Backgrouds include Krauser's Castle complete with rain (not as much as KOF'99, mind you) and the busy streets of Hong Kong where, if you're lucky, you can send your foe into a kiosk selling pig heads. Mmm, Mmm, pig heads, delicious. Character Design and animation (especially that of Duck King) is equally beautiful, very fluid, and Characters don't look that bad on the far line or while shifting between lines, either. Fire and shock effects all well done. And may I say, The most blood I have ever seen in a Non-Weapon SNK fighter. Now this is what I'm talkin' about. Most of the BGMs are on SNK's Greatest Hits, and the others should be in the boxed set somewhere. Yamazaki, Billy, and the Duck, have some great tunes, Krauser has a nice opera sounding track, And Terry is back to his old familiar BGM. Some Gripes I have are Geese's remix, his theme song used to totally rock, but this time it sounds too Japanesey. Note to Geese Howard: This ain't Samurai Shodown. If you like Geese's theme song, stick with KOF'96. Gripe number two, SOMEBODY SHUT THAT DAMN ANNOUNCER UP! I will admit he isn't as bad as the Street Fighter Alpha 3 announcer, but he's bad. Fatal Fury Perfection at it's finest. Ring-outs are gone, and there was jubilation across the land. Objects in the corners are still there, only they dizzy the character upon breaking this time around. DMs and SDMs still deal an unholy amount of damage, and Control is dead-on accurate. There isn't even a trace of any "SNK boss syndrome" It just doesn't get any better. Nice Touches- Unlock and pick Geese Howard with the D-button for a nice "Corpse" look. Also, some funny stuff happens when a corner object gets broken. Check them out, they don't disappoint. Neither will the short ending sequences. This is another one that is hard to put down, the game is very inexpensive at around $150 for the NGH version and is definitely worth every cent. 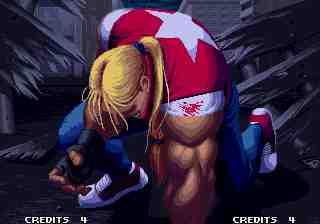 There is a lot of Fatal Fury goodness packed into 394 megs. If you don't own this game on any format, get off this review and buy it now.